My wife, Julie, and I lived in San Francisco for many years and I had been hoping to move back to my hometown of Davis. When the opportunity came to move back to Davis, my wife and I agreed that we would get an electric car so that I could use the HOV lane for my daily commute to Oakland. Another factor in our decision was the gas savings, which cover over 70% of my monthly car payment. We also like being able to help the environment. We installed solar panels on our house so we can directly supply my car with power produced at home. The gas savings have been substantial, but the upfront cost of the car was still significant. The 2018 Nissan Leaf has an MSRP of about $30,000, while a similar gas-powered sedan can retail for close to half that. Nevertheless, the Nissan Leaf is one of the cheapest fully electric vehicles with a high range. And with state and federal purchase incentives, I will receive a $10,000 rebate from the government ($2,500 from state incentives and $7,500 from federal). PG&E offers its customers an additional $500 for purchasing an EV. Finally, EVs do not require as much servicing as cars with combustion engines, so that provides additional cost savings. The other factor to take into consideration is that if you drive a significant amount, you will want regular access to a Level 2 (higher-speed) charger. In California, there are a lot of Level 2 chargers that are accessible to the public, and many offices (including mine) provide Level 2 chargers to employees. But as EVs become more popular, competition for Level 2 chargers is increasing. I decided to install a Level 2 charger in my house powered by my new solar panels, which was expensive. I had to upgrade the electrical panel (about $3,000), trench a new higher gauge cable to the panel (about $4,000), purchase a Level 2 charger (about $400–$800), and install a new outlet and connect the charger (about $500). Most people will not have to replace their panel or trench, but, if you do, it will add substantial costs to your project. 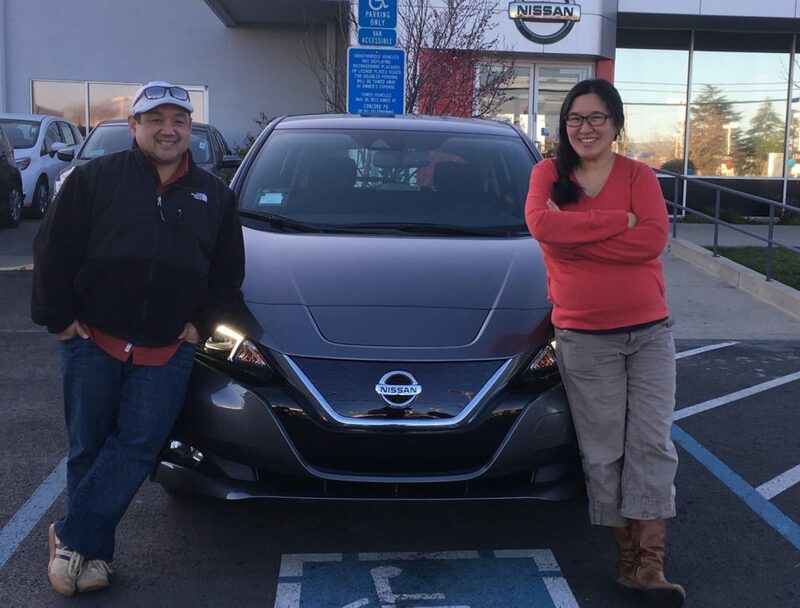 Edgar and Julie Wong-Chen and family found the perfect win-win-win scenario with their brand new 2018 Nissan Leaf. Photo courtesy Edgar Wong-Chen. The biggest challenge is making sure that my car has a full charge daily. My daily commute is 134 miles round-trip. While the Leaf is supposed to get about 150 miles per charge, the actual range is never the advertised range: road conditions and the use of heating, air conditioning, and the radio can all affect vehicle performance. I rely on my office garage charging station to recharge and make sure I can complete the trip home. I’m lucky that our garage has a valet service that rotates EVs on the chargers. I’m also glad that my Leaf (and most other EVs) allow you to monitor charge status via a phone app. If my car did not have this, I would have to walk down to the garage to make sure the valet service was rotating my car in enough time to charge for the trip home. One benefit of the Leaf is that if you work or live near a Nissan dealership with a “supercharger”, or Level 3 charger, you can use it to charge your car up to 80% in about 20 to 30 mins. I am fortunate to work near a Nissan dealership and use their Level 3 charger if I cannot get my car fully charged at work by the end of the day. If charging at my office was not available or there was not a Nissan dealership near me, I would NOT have bought the Leaf because the range isn’t enough for me to comfortably make my round trip commute. A large misconception of going electric is the potential cost of replacing a battery. Only time will tell how long batteries in today’s EVs will last. But to my knowledge, many cars that utilize battery technology and have been around for many years—like the Toyota Prius—have rarely had their batteries replaced. I only know one person who had to replace their Prius battery, but even that was only after driving well over 200,000 miles. And they replaced it for less than $1,000. Right now, I only use my EV for my daily commute. For longer trips we utilize our gas car. If I were to take it on a “trip,” the furthest I would go is from Davis to the Bay Area, but knowing that I’d have to recharge to get back is anxiety-inducing. As EV charging infrastructure improves, I believe that taking longer trips in my Leaf will become more convenient. 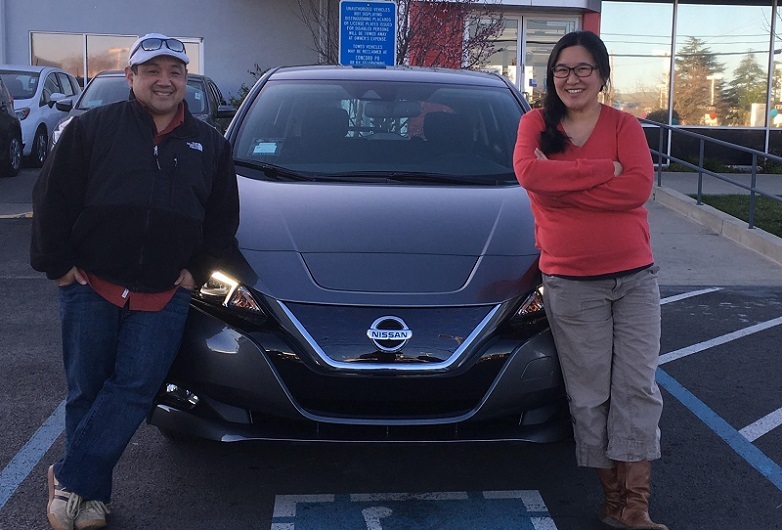 We were very excited to be one of the first owners of the 2018 Leaf in Northern California. The dealership literally had to unwrap the car since it and the other 2018 Leafs had just arrived from the manufacturer. The nicest experiences are the conversations that many people like to have with my wife and I about the Leaf and going fully electric. I tell them that it’s not an easy decision, but in the right scenario it’s a no brainer. For us, it’s a huge win-win-win financially, for the environment, and for letting me use the HOV lane in my daily commute. I think there are different motivators for different owners. I’ll throw out two ideas. For commuters, having access to the HOV lane is a daily game changer. Depending on the day, I estimate that using the HOV lane saves me about 30 to 40 minutes in my morning commute from Davis to Oakland and about 30 to 60 minutes in my evening commute from Oakland to Davis. That allowed me to move back to Davis, a place where I can afford to own a home and where I want to raise my family. Expanding HOV lanes in and outside of the Bay Area would likely encourage more people to go electric. For penny pinchers, having an EV can lead to big cost savings on gas and maintenance. But right now, federal and state incentives are key to making the upfront costs of EVs competitive with gas vehicles. We need these incentives to stick around until technology improvements drive EV costs down. The incentives were definitely key in our purchase decision. The EV&Me blog was created by Hannah Safford, Researcher for the UC Davis Policy Institute for Energy, Environment, and the Economy. The original post is located on the UC Davis Institute for Transportation Studies web page. Browse on over for instructions on how to submit your EV story! EV owners/drivers wishing to be featured in an upcoming EV&Me post can self-nominate by filling out this form. Note that the blog is not limited to Davis residents. Nominations are welcome from all over! EV drivers and owners are also encouraged to share their stories using the hashtag #EVandMe. For more information about electric vehicles and rebates, check out the Cool Davis Drive Electric web page.